On this day in 1783, following the signing of the Treaty of Paris, General George Washington resigns as commander in chief of the Continental Army and retires to his home at Mount Vernon, Virginia. Washington’s willingness to return to civilian life was an essential element in the transformation of the War for Independence into a true revolution. During the war, Congress had granted Washington powers equivalent to those of a dictator and he could have easily taken solitary control of the new nation. Indeed, some political factions wanted Washington to become the new nation’s king. His modesty in declining the offer and resigning his military post at the end of the war fortified the republican foundations of the new nation. "While I repeat my obligations to the army in general, I should do injustice to my own feelings not to acknowledge, in this place, the peculiar services and distinguished merits of the gentlemen who have been attached to my person during the war. It was impossible the choice of confidential officers to compose my family should have been more fortunate. Permit me, sir, to recommend in particular, those who have continued in the service to the present moment, as worthy of the favorable notice and patronage of Congress. The patronage Washington requested seemed most pressing as the army had narrowly survived several mutinies and a near-attempted coup the previous autumn. The veteran officers who had helped to keep the army intact desired western lands in thanks for their service. Their claims would constitute a major issue for the new American government as it attempted to organize the settlement of what had been the colonial backcountry. "Having now finished the work assigned to me, I retire from the great theatre of action; and bidding an affectionate farewell to this august body, under whose orders I have so long acted, I here offer my commission, and take any leave of all the employments of public life." General Washington’s respite proved extremely brief. He was unanimously elected to the first of two terms as president of the United States in 1788. In March 1783, Washington used his influence to disperse a group of Army officers who had threatened to confront Congress regarding their back pay. By the Treaty of Paris (signed that September), Great Britain recognized the independence of the United States. 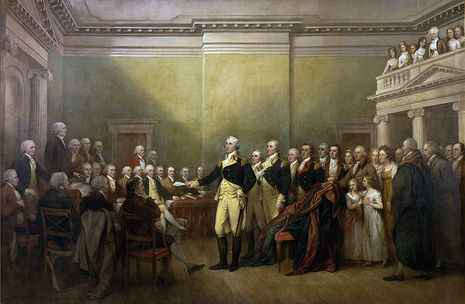 Washington disbanded his army and, on November 2, gave an eloquent farewell address to his soldiers. On November 25, the British evacuated New York City, and Washington and the governor took possession. At Fraunces Tavern on December 4, Washington formally bade his officers farewell and on December 23, 1783, he resigned his commission as commander-in-chief, emulating the Roman general Cincinnatus. He was an exemplar of the republican ideal of citizen leadership who rejected power. During this period, there was no position of President of the United States under the Articles of Confederation, the forerunner to the Constitution. Washington's retirement to Mount Vernon was short-lived. He made an exploratory trip to the western frontier in 1784, was persuaded to attend the Constitutional Convention in Philadelphia in the summer of 1787, and was unanimously elected president of the Convention. He participated little in the debates involved (though he did vote for or against the various articles), but his high prestige maintained collegiality and kept the delegates at their labors. The delegates designed the presidency with Washington in mind, and allowed him to define the office once elected. After the Convention, his support convinced many, including the Virginia legislature, to vote for ratification; the new Constitution was ratified by all 13 states.